Dark and Lovely Fashionista Model Search-Your time to shine! Dark and Lovely and Essence Magazine have partnered once again to present the search for the NEXT “Dark and Lovely” Fashionista Model Search. One lucky winner will receive a trip to NYC, a $5,000 shopping spree with a celebrity wardrobe stylist, a makeover with a celebrity hairstylist and be featured in ad in ESSENCE Magazine. The winner will also be unveiled during New York City Fashion Week. Are You Dark and Lovely? 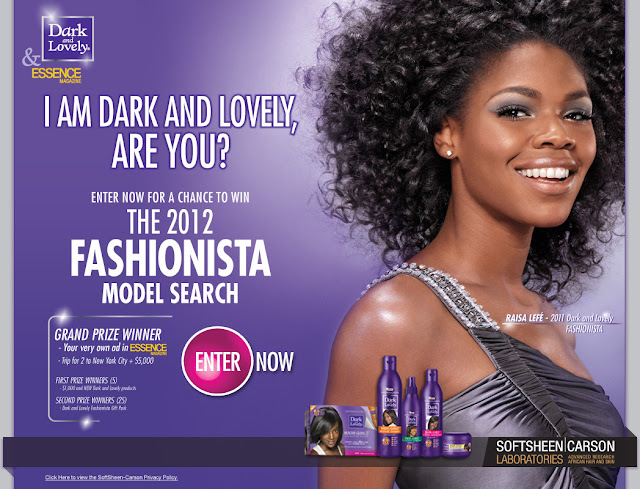 New York, NY (April 1, 2012) – The search is on for the next Dark and Lovely® Fashionista! Partnering for the third year in a row, SoftSheen-Carson®Dark and Lovely, the #1 ethnic haircare brand in the world in partnership with ESSENCE, the premier lifestyle magazine for African-American women, announce its2012 Dark and Lovely Fashionista Model Search. The national contest begins on April 1st and will continue throughJune 30th. One lucky winner will be revealed in her very own Dark and Lovely ad to be featured exclusively in an upcoming issue of ESSENCE magazine. The Grand Prize winner will receive a trip for two to New York City, a $5,000 shopping spree with a celebrity stylist and a hair makeover by a celebrity hairstylist. The winner will be formally announced at a grand unveiling event in September during New York City Fashion Week. Additional contest prizes include: First Prize Winners (5) will receive $1,000 and new Dark andLovely Healthy-Gloss 5™products. The Second Prize Winners (25) will receive a Dark and Lovely Fashionista Gift Pack. For official contest rules, please visit www.essence.com/iamdarkandlovely. No purchase necessary.